Our engineers are busy getting ready for our first production run now scheduled for the first part of 2006 due to significant feature improvements, and quantities will be limited! So reserve your VroomBox today, with no obligation. When your unit is ready, you will be contacted by e-mail to confirm your order and make payment. Packaging and features may vary somewhat in the final product. NOTE: State and local laws may limit the type and level of noise a car can make. It is your responsibility to understand and comply with all applicable laws in your area. 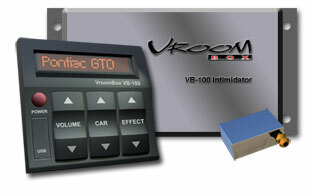 Check back at this website for updates and information on VroomBox often. Meanwhile, please complete the pre-order form below. All fields with an asterisk (*) are required, and we would greatly appreciate you taking a minute or two to complete the survey as well. Once everything is filled out, hit the "Pre Order Now!" button at the bottom of the page. *NOTE: any existsing pre-orders placed prior to 7/21/05 for an earlier configuration will still be honored at the original price!